R.D. Olson Construction Completes 468-Unit Multi-family Project in Costa Mesa, Calif.
Costa Mesa, Calif. and Rancho Mission Viejo, Calif. – R.D. Olson Construction has completed an extensive renovation of 27 Seventy Five Apartments, a 468-unit garden style apartment community in Costa Mesa, Calif., owned by UDR, Inc. The property has been repositioned with contemporary upgrades and features to meet the needs of today’s apartment residents. The Irvine, Calif.-based general contractor renovated all apartment units and building exteriors at the project, upgraded infrastructure and amenities throughout, built a new 14,000-square-foot community building and reconstructed the three-acre lake that is the centerpiece of the community. The updated apartments feature sleek open living spaces with contemporary lighting, modern kitchens, luxurious bathrooms and ample windows. Community amenities include upgraded eco-friendly landscaping, lighted sport courts, a pool, and outdoor lounges and grills. The newly-constructed community building features a rooftop lounge, game room, conference and business centers, fitness facilities, and a great room with a fireplace. The project was designed by Costa Mesa, Calif.-based Newman Garrison + Partners. This project completion comes at a time of increased activity in lifestyle projects for R. D. Olson. These projects are designed to enhance guest and resident experiences by providing resort-caliber amenities. The firm has completed several upscale recreation buildings for the Rancho Mission Viejo Company, in the master-planned residential communities of Sendero and Gavilán in Rancho Mission Viejo, Calif., including four recreation buildings – Hacienda, Ranch House, Guest House and The Outpost. The 11,000-square-foot Hacienda caters to senior adults and includes a luxurious great room with bar, yoga studio and fitness center, outdoor cabanas and bocce courts. 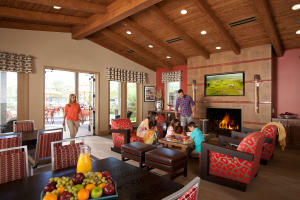 Ranch House is a 5,400-square-foot clubhouse that features an exercise room, pool, spa and water play area for kids. The 5,800-square-foot Guest House includes a community room and full catering kitchen for residents. The Outpost, a 2,200-square-foot clubhouse, features a pool and spa, complete with a bar, outdoor cabanas and bocce courts, as well as a barbeque and hammock area. R.D. Olson is growing its construction presence across several real estate sectors, including multi-unit and healthcare properties, in addition to the firm’s acclaimed construction activity in hospitality projects. The firm was recently recognized by Marriott International with the hotelier’s Icon Award for excellence in architecture and construction.